The Adventures of a traveling travel agent. Booking your adventures while living my own. 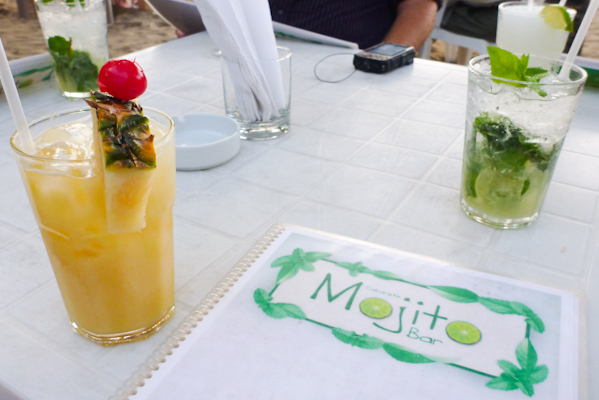 As it’s name suggests, Mojito bar is the place to go in Cabarete for Mojito’s! It was a popular spot for the students from my school in Sosua to go to for 2 for 1 happy hour once or twice a week. Unfortunately I don’t like Mojito’s, but they were popular and sure looked pretty! The bar had a list of 4 or 5 options for their 2 for 1 deal. I opted for 2 for 1 Pina Colada’s. Sadly they were the worst Pina Colada’s that I had ever had. They seemed to solely be pineapple juice and liquor. There was no coconut flavor at all. They were thin, weak and lacked any resemblance to what I expected for a pina colada. Even at 2 for 1 they were sub-par. Service here was friendly and good, although regularly a bit slow because the bar is tiny and the customers are plenty. If you are stopping by for a bite to eat the sandwiches are yummy, but make sure you order early before the kitchen closes! The fresh squeezed juice that accompanies the sandwich menu is hit or miss. It depends on the combination of fruits, but twice I was served juice that was too sour to drink. Fresh should still mean ripe! Overall, not my favorite location for drinks, but the sandwiches were good and I hear the Mojito’s were worth it! PJ’s was one of my regularly frequented restaurants in my three-week stay in Sosua during August 2012. Located on the main strip of Pedro Clisante it was easy to find and hard to avoid as it was close to the main beach, close to the main road from Puerto Plata to Cabarete and amongst a variety of touristy restaurants on the main street of the town. About a week after my return to Canada (Sept 2012), I’ve learned that PJ’s is now under the name of Sinatra’s, but boasts the same great service and food! Initially I went with a group of students from my Spanish school. Although the restaurant was busy, our group of seven or eight was quickly accommodated. Staff moved tables together and made us feel welcome. The atmosphere, the food and the service were all very good by my Canadian standards, which really made them exceptional for Dominican standards. Often, Dominican restaurants are not known for their good service, but this spot proves differently. On a second visit, I ate alone on a less busy night at the restaurant and was joined by Steve, the owner to talk about all things Dominican and the economy in the area. He was very friendly and I stayed late just enjoying the variety of topics that we conversed about. Many nights I saw him talking with new customers or re-welcoming the regulars. Always with a friendly smile on his face and always making time to converse. Let’s talk about the food here! It truly is delicious and the price can’t be beat. I am sure that I ate at this restaurant at least 10 times and was only once slightly disappointed (I wasn’t a fan of the meat nachos here). The English style fish & chips were my favorite. A large portion of fish, perfectly battered and served with a tangy tartar sauce. On top of it being delicious, it was on the PJ’s specials for just $250 RD. A bargain at that price! My second favorite was the Chicken Parmasean. A large portion of lightly battered chicken covered in tasty tomato sauce. Served with fries or mashed potatoes. Thirdly, if you are particularly hungry, go for the ½ chicken. It was huge, served hot, with a small salad and fries. The barbeque sauce was tangy and mouth watering too. I could only eat about half of my meal and felt bad that I wasn’t able to finish. The staff here are friendly, fun and if you frequent the restaurant, you’ll start to know them by name, as friends, and they’ll be happy to welcome you back. I had great conversations with many of them and they even put up with me while I practiced my new-found Spanish skills. When the restaurant is busy you’ll see the staff moving quickly about to take care of all of the customers as quickly and efficiently as possible. When the restaurant is slow, you can find staff waiting near the front entrance ready to welcome you and make you feel at home. Many of the restaurants have staff at the front begging and bribing you to sit down for a meal. At PJ’s, they were simply there as friendly faces, ready to answer your questions and help you, but not in a pushy or annoying way. Wednesday and Friday nights were 2-for-1 meal nights (with some exceptions) until 8pm and then karaoke from 8pm – 12am (ish). On top of the already outstanding prices, a 2-for-1 deal was a steal and made for a great cheap night out even once you paid regular prices for your drinks. The karaoke equipment is excellent and provides for great entertainment without the shotty crackly speakers of many of the other local establishments. There are regulars who try their talents at karaoke every week who are pretty good. There are always a few who do it just for fun and have no talent and then every once in awhile there’s a real star among the singers who will just blow you away! They have a huge variety of karaoke songs, so if you like to sing, I am positive you can find something just right for you. 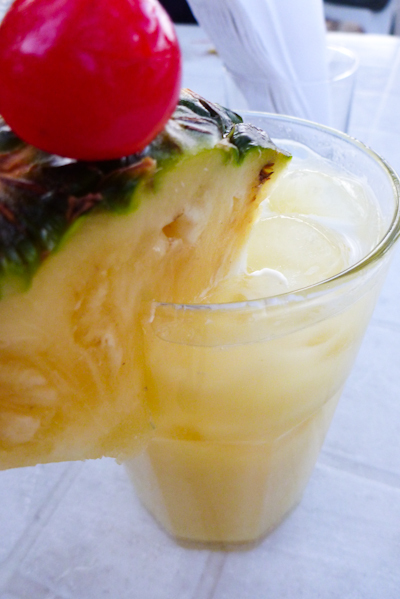 If you are a fan of Pina Colada’s give one a try here. 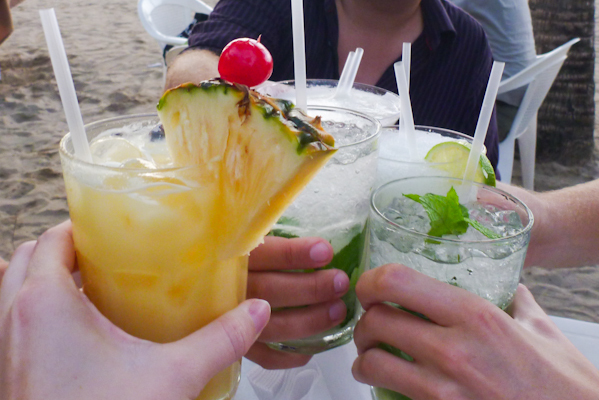 Well blended, cold and an excellent mixture of rum, pineapple juice and coconut flavors. It didn’t disappoint. If you are traveling in the Dominican for a long period of time and find yourself eating out a lot, you might need a break from Dominican traditional food. For me, I was craving something familiar and flavorful. I spent three weeks in Sosua, eating out every single day. I was a little tired of pizza, salad, beans and rice and fried fish. Chi chi’s Burrito Hut is a tiny little hole in the wall place in the tourist district of Sosua. It seats a total of about 15 people if you try really hard. Five people can fit inside on bar stools at a counter, and about 10 can be seated outside on the sidewalk under big umbrellas. The relatively new owner of this little spot is Canadian, friendly and serves up a great chicken enchilada! I ate at Chichi’s four days in a row for lunch in August 2012. I went the first day with one friend and then we were so happy with our meals that other friends wanted to go the next three days. They have a great menu full of Mexican delights. Enchiladas, burritos, tacos and much more. Although the chicken enchiladas reined as my favorite, I have nothing but good things to say about all of the dishes that I tried, including burritos, quesadillas and tacos. The Enchiladas were served hot on a skillet, smothered in delicious melted cheese and were surprisingly filling. Salsa, sour cream and guacamole on the side, paired with a coke, my meal came to about $350 RD. The burritos and tacos were slightly cheaper, but for the love of cheese, the extra $100 RD was worth it to have the enchiladas! Service was pleasant and appropriately paced for the Dominican. Don’t stop in expecting ‘fast food’, this is a small restaurant in the Dominican, but none-the-less, we were always able to arrive, eat and pay within about 45 minutes. Remember, good things take time in the Dominican! Take your time and stop to check out this delightful little spot for some tasty Mexican food. Subscribe to our photography newsletter for tips, tricks & advance notice of amazing Photo Tours! Get My Blog Posts direct to your Email! Who uses a travel agent and why?